Gareth Bale, A Modric In The Making? In Abu Dhabi, he scored three in the semi-final and had four clear cut chances and almost scored another incredible overhead kick, connecting two metres into the air and only just missing the goal. Without any doubt, he was the best player in the tournament. A year ago, Luka Modric began the best year of his career with a stand out display in this same tournament, and now Bale is stepping up his game. Gareth Bale arrived in Abu Dhabi surrounded by doubts from outside the club, though the club and the dressing room have always had their trust in him and his football. Circumstances, with injuries and doubts about his form, stopped him from finding the kind of consistency that any top player needs to thrive. The Club World Cup provided the Welshman with the opportunity to be a reference point for Real Madrid, something that they’ve been looking for ever since Cristiano Ronaldo departed. Real Madrid fans have long known that they can rely on the Welshman for the big occasions and in Abu Dhabi he showed it yet again, earning the support that he needs. He was the best player on the field and now he just has to produce that form inLaLiga Santander to prove that the club’s best paid player is also the best performer, as was the case in the Zayed City Sports stadium. 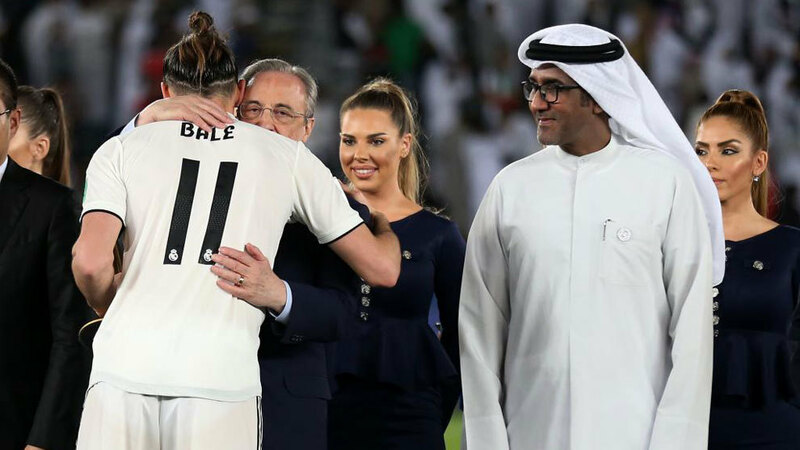 The embrace between Bale and Florentino Perez as they collected the trophy on Saturday night was symbolic of the club’s triumph and their policy. Even in crisis and awful moments, Los Blancos just keep winning and Perez has now won 24 titles, 14 of them with Bale on the pitch, including four Champions League titles. Under Solari, Bale has found the time and space to develop his play. He struggled to do so earlier on in the season as muscle and ankle injuries saw him fade against the likes of Eibar. The new coach has listened and they had a long conversation on the pitch on Saturday, because it is Solari who has been fundamental to moving Bale back to the left where he is more comfortable, more involved and more decisive. As the images showed in the celebrations, Bale is trusted, and the challenge is there for him to maintain this form in the weeks ahead. Like Modric before him, evidenced in his standout performance in the same world club championship, last year – followed by the Croat’s inspiring play in leading his country to third place at this year’s world cup in Russia – could Bale succeed not only Cristiano Ronaldo (as The Man at Madrid) and Luka Modric wearing the crown next year as the world’s best player? Only he can answer it. Come on, Bale! To be or not to be?